Transportation Costs > How Much Does a John Deere Gator Cost? How Much Does a John Deere Gator Cost? The very first John Deere Gator utility vehicle came out in 1993, and since then, several models and variations have become available. 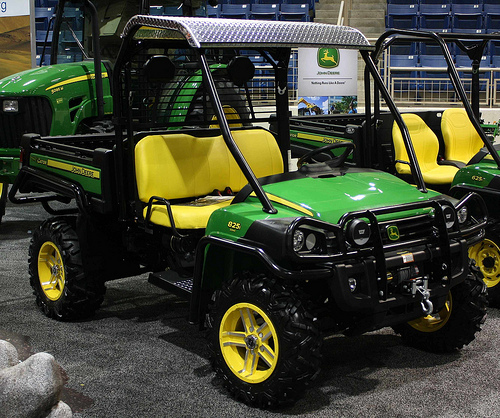 The John Deere Gator is a line of small all-terrain utility vehicles that are produced by the John Deere Corporation. Manufactured in a variety of configurations, this Gator family of utility vehicles are designed to be used on farms, ranches, and worksites rather than as pure off-road vehicles. The cost of the John Deere Gator will vary depending on the drive system preference (2WD, 6×4 or 4WD0, the cargo hauling needs, terrain capabilities, engine power, power type, seat capacity, if power steering is required and which attachments, if you choose to need them, are added. From our research, the most basic John Deere Gator vehicles, with no attachments, can start at $7,000 to $16,000+, but if you were to add attachments, it could easily increase the costs by more than 20 to 40 percent. John Deere makes it easy for you to find the right Gator for your situation. To help you decide, they created a product list with questions you can answer, and with these answers, they will display the right series/model, along with the corresponding prices. John Deere offers five types of Gator vehicle options: the Work Series, Crossover Utility vehicles, High-Performance, Military and Turf Utility. The Work Series (TS, TX, TH, HPX), known as the traditional utility vehicles, are easy to use, hard working and come in a variety of mid-range and full-sized options. The Crossover Utility (XUV) vehicles, a newer line of utility vehicles, offer off-road performance with full-size and mid-sized models. The High-Performance service, similar to the Crossover, are trail read and are capable of light hauling. The Military Utility vehicles are designed for military operations. Lastly, the Turf Utility vehicles are designed for larger jobs and heavier loads. Attachments, while optional, can be added to any Gator series. These popular attachments, all with varying costs, include roofs, lights, an AMS integration kit, winches, protection options, a windshield, lift kit, snow removal options, tool rack, utility cart, cab and more. Taxes and delivery fees, when purchasing new, won’t be included in the estimates above. Special offers are often available. Refer to the official John Deere website before going to a local dealership to see which options are currently available. Hundreds of used models in good working condition can be found eBay for less than 60 percent of the MSRP. 2004 John Deere Gator. With 106 hours. No accessories.